Dr. Bronner's soap is probably old news for a lot of you. 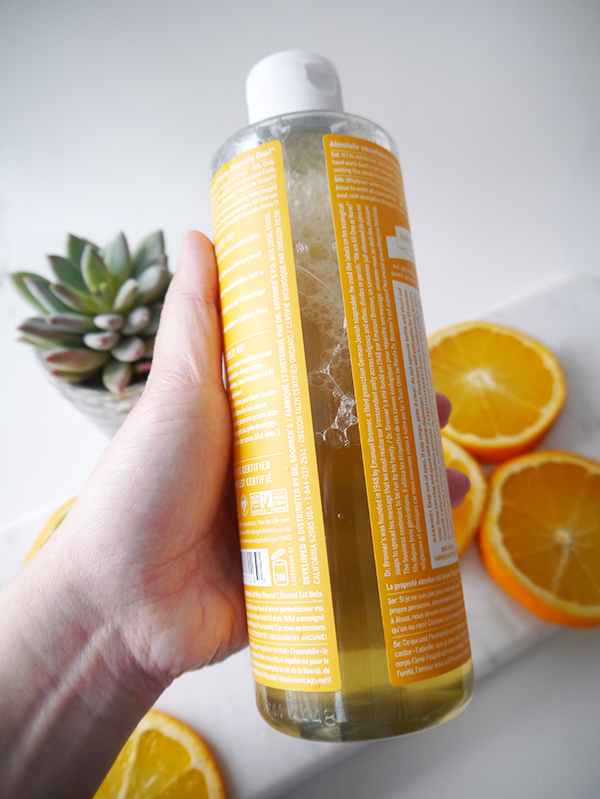 As someone who's transitioning into green beauty and increasingly curious about natural cleaning solutions though, it has proven to be a total game changer. 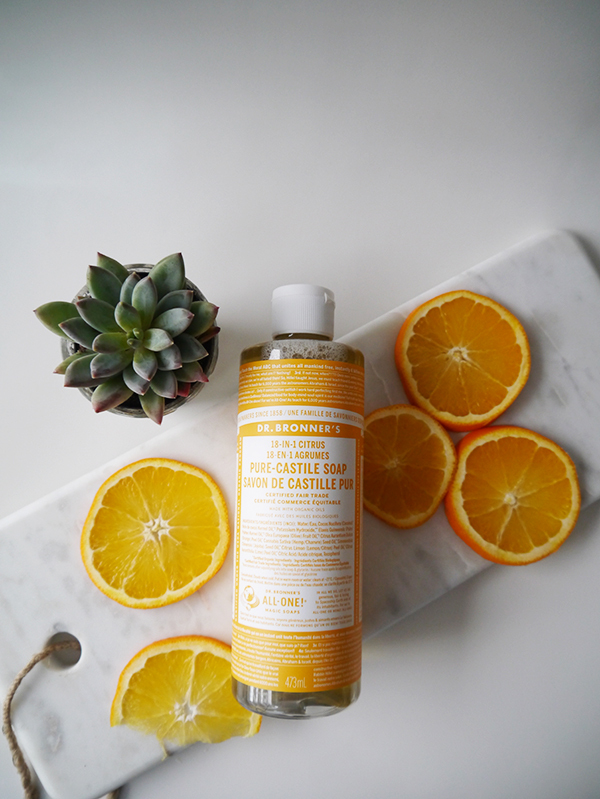 The bottles would always catch my eye when I was browsing Welk's General Store with their colourful, script-covered labels, but it wasn't until I researched this cult fave at home that I was intrigued enough to buy a bottle of my own. This is an all-natural, biodegradable soap inspired by a traditional Old World recipe. The formula uses natural ingredients (many of which are organic and/or certified fair trade); alkali and fat to create a sudsing action instead of chemicals and sulfates; and essential oils for fragrance. The result is an ultra-concentrated soap, gentle enough to be used on humans because of its all-natural formulation but tough enough to clean your home. You can mop with it, wipe down furniture with it, do laundry with it, wash dishes with it...the list goes on. 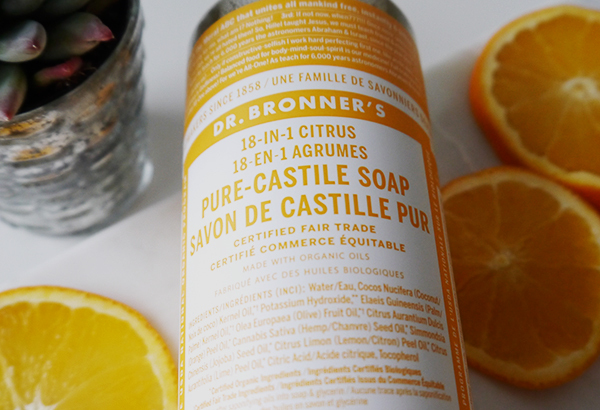 The key lies in how much you dilute Dr. Bronner's. According to their website, you can use Dr. Bronner's in 18+ ways; they recommend pre-diluting solutions for different purposes and keeping them in containers and bottles for convenience. Personally, I won't be trying it as a replacement for shampoo or toothpaste anytime soon, but it works wonderfully as an all-purpose cleaner and for hardwood floors. I use about 10-15 drops to a litre of water for a mopping solution or to wipe down furniture. Because it's all-natural and biodegradable, I don't have to go over everything again with plain water to remove cleaning chemicals. The first time I mopped with Dr. Bronner's, the boy declared he could feel how clean the floors were through his socks and complimented the lingering scent of citrus oils. That was with the tiniest amount of soap, so you can imagine how long the 473 ml bottle I picked up will last us. The boy has since used it to soak and wash his smelly kickboxing handwraps. I'm going to use it with the OXO Good Grips Microfiber Spray Mop for an environmentally friendly version of the Swiffer WetJet. When our liquid hand soap runs out, I might also buy a foaming soap dispenser and use a half-and-half dilution to make a foaming hand or body wash. (Full-strength Dr. Bronner's can clog conventional liquid soap dispensers.) Only 1.5 cm of soap is gone from the bottle, but it's official: I'm on the Dr. Bronner's bandwagon. Dr. Bronner's is such a great multi-use product. I personally love it for shampoo (actually) and for cleaning my makeup brushes! Glad to hear you've discovered it and love this stuff too! Ooh yes, cleaning makeup brushes! Another use to add to the list, and it'll leave them smelling so nice and citrus-y too. I've heard mixed reviews about Dr. Bronner's as a shampoo, but hey, it's probably worth trying at least once.